US Builders: The best metal boat builders are in Europe and New Zealand. When I bought the Swan in 2000 I paid $.88 / Euro. By 2005 the exchange rate was roughly $1.25 / Euro, a 40% decline in purchasing power. The crumbling US dollar had put European and New Zealand builders out of my price range. 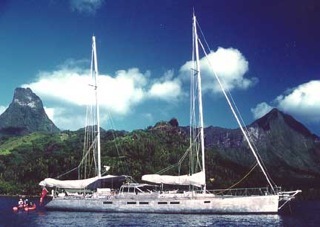 The metal sailing yacht market in the US is tiny and the builders are focused entirely on mega yachts for good reason. There were more builders to choose from by building in fiberglass. 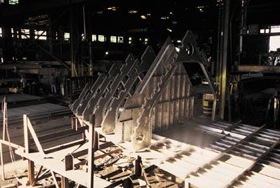 Size: Metal boats can be built faster and cheaper than fiberglass boats because they don't need a mold; the builder just cuts out the pieces and welds them together. This is an enormous savings on a larger boat and the economics of building a larger boat from metal are very compelling, but for a smaller boat, not so much. Another size factor is the framing. A metal boat has metal frames which on a 50' boat will be 4" - 6" deep, reducing the interior beam (or width) by 8" - 12". This doesn't sound like much, but it's meaningful when the widest part of the boat is only 15' to begin with, particular as you move towards the ends of the boat. The final size factor is the plating. According to Chuck Paine, he would have needed to specify thicker plating than was really structurally necessary to prevent "oil canning", or the flexing of the plates between the frames. The flexing is not a structural problem, but it is unsightly and at times unnerving. So I'd pay for thicker plating, and always haul the extra weight around. On a larger boat the plating would need to be thicker anyway so there was no issue. Resale: Europeans like metal boats, but Americans are not so keen on them. Taking a boat to Europe to sell is tricky from a tax standpoint, not to mention that the buyer will expect 230vac internal wiring. The US market would be a tough market, meaning lower resale value. A couple of horror stories also contributed to my decision. There are plenty of stories about metal boats that were poorly maintained and had a shortened life (though the same is true of fiberglass or wood boats, you have to do the maintenance). But I had personal knowledge of two boats that were built from defective aluminum. The build quality was fine, but the aluminum plating was flawed and the boats had a shortened life to say the least. One of the boats had to be entirely scrapped within two years of being launched and the owner was left to fight with his insurance company and Alcoa. The other boat was sold for next to nothing after about ten years when the problem fully manifested itself. Fiberglass is a well understood boat building material with broad market acceptance. 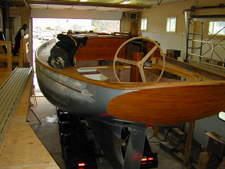 The resulting boat is lighter than either wood or aluminum and requires less maintenance. When I asked Cees van Tongeren what material he would use for a boat for himself, he said fiberglass. So while metal is the material of choice for many long term cruisers, and a very practical material when cruising, I concluded that fiberglass was the best material for the new boat.